The country’s new-energy car vehicle sector is attracting several automakers in China to make inroads into the industry amid the sluggish market sales and major issues that include local protectionist policies and lack of charging facilities. 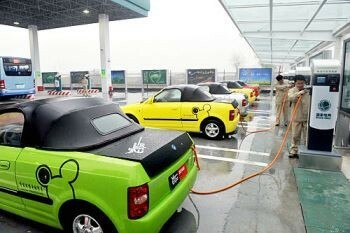 The China Association of Automobile Manufacturers said that the sales of new-energy cars reached 2.4 times year-on-year in the first half of 2015, as overall auto sales dropped 7 percent. "China will become the world's largest new-energy car market in 2015, outpacing the U.S., where new-energy car sales topped 117,000 in 2014," Xu Heyi, chair of Beijing Automotive Group, said. Xu told the China Business News that his company will step up its research and development (R&D) for new-energy cars, which account for one-third of its R&D outlay. According to the paper, since May, several enterprises, which included BYD, Great Wall Motors and Lifan Group, have intiated investment projects for new-energy cars totaling 40 billion yuan ($6.44 billion) in scale. A new-energy bus venture was also set up by SAIC Motor and Wanxiang Group, a leading auto parts maker, with plans to establish a manufacturing base in Hangzhou with an annual capacity of 5,000 buses. The report added that the capital that flowed to the new-energy sector amounted to 100 billion yuan ($16.1 billion) in the first half of the year. Aside from investing into production, established auto firms have also engaged themselves into leasing operations, charging facilities and the industrial chain of new-energy cars. The paper, however, said that despite this development, the new-energy car sector is facing a number of major roadblocks, as some local governments include protectionist provisions in their policies to promote the development of the sector, leading to barriers. In addition, consumers who own limited models of new-energy cars decry the inadequacy of charging facilities.